I'm having an issue with static routing. I have a topology setup similar to the one shown in the CCENT series of videos. I'm practicing static routing. I'm trying to setup the static routes in such a way that where two paths exist, if one fails the router will take the alternate path. Here is my topology. Router 4 is taking the path toward Router 2 instead of heading towards router 6. As you can see we have to routes to the 192.168.4.0 network. One path toward Router 3 and the other path toward router 6. 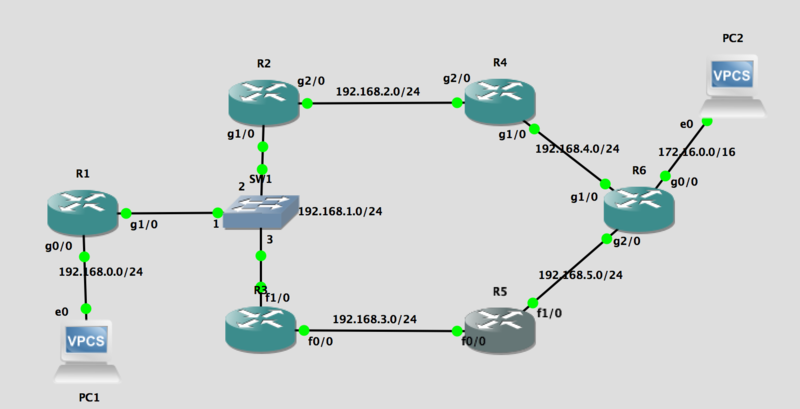 Why isn't Router 5 taking the alternate route if it sees that the route to R4 towards Router 3 is broken? Is it because static routing doesn't know how to handle a situation when one of two paths fail? Please look at my diagram and explanation. Let me know if you want me to provide anything else. Maybe I need to add a metric to one of the routes so that if the primary fails the secondary kicks in? My previous post regarding inter layer 3 switch routing was never solved, I hope Ronnie or someone can provide some expertise on this question. I believe I answered my own question. After doing re-watching the CCENT video on static routing with Ronnie and Don I did have to change the admin distance metric from the default value of 1 to 2 on the second path. In addition I need to be careful of the direction of my routes and which route is primary and secondary. After adjusting the admin distance metric I am able to successfully ping from Router 5 to Router 4 via Router 6 when the link downstream from Router 3 goes down. Going through this exercise clearly shows the advantage dynamic routing has over static routing when there are multiple paths. As Don stated Static routes are only as smart as the person who configured them because we as humans have to manually tell the router what to do. If anyone needs clarity in this area, I would strongly recommend re-watching the CCENT videos on static routing along with performing the configuration on live or virtual equipment. Great job figuring it out! Static routing's administrative distance is always a 1, if you want to default to another path, if the route fail, it's something called a "floating" static route. This is essentially a backup route for the router if the route from the routing table disappears!